In today’s post: Help your teens and tweens find fun things to do this summer with 100 summer activities for teens. Every year about this time I’m both incredibly excited to have my kids home all summer and moderately panicked about how exactly we’re going to fill all those leisurely hours. I’ve shared lots of summer fun ideas for kids before, but my own children are getting older and many of the items on those lists don’t quite cut it anymore (somehow the 15-year-olds aren’t terribly pumped about making a tin foil boat or soup can stilts). It can be hard finding summer activities for teens, especially those under 16: they’re too old to be excited about going to the zoo with mom, but aren’t quite old enough to get a summer job or drive places with friends. 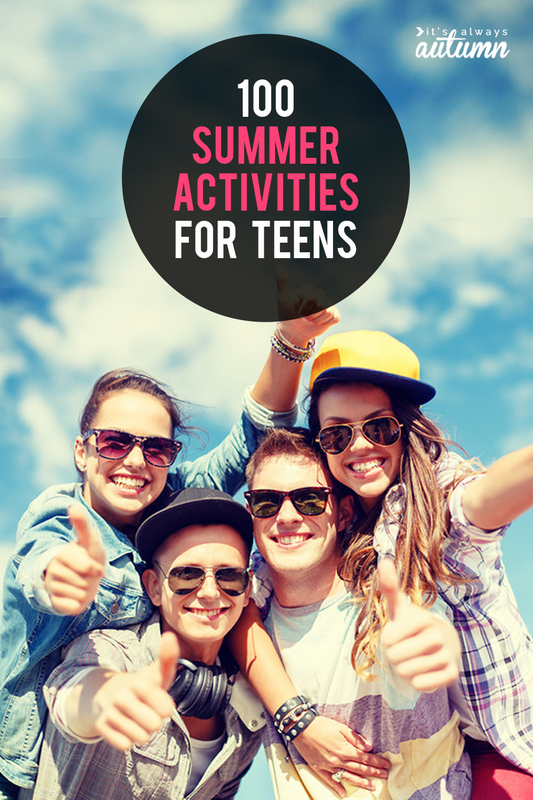 So I’ve gathered 100 fun summer activities for teens (and tweens) so they can stay busy and have a great summer. Note: this list is geared toward teens and tweens, which means some ideas will be more interesting to those at the younger end of the scale (ex: making marshmallow launchers) while others will be more appropriate for older kids (ex: going on a college campus tour). But there should be plenty of ideas for everyone. Note #2: click on linked text to get more info/instructions about that specific idea! Any product links to Amazon are affiliate links. 1. Walk to the gas station or soda shop for sodas or slushies. 2. Play “bigger better best” with friends. 3. Make a giant slip-n-slide. 4. Make a marshmallow launcher. 5. Get an inexpensive badminton set and learn how to play. 6. Learn to play California Speed. 7. Learn how to code. 8. Have a water balloon fight. 9. Build a water balloon launcher. 11. Invited friends over to play capture the flag at night when it’s dark. 12. Check out the food trucks in your city. 13. Make homemade ice cream. 14. Visit a pet store to hold/play with the animals. 15. Go on a college campus tour. 16. Play the dice game. 17. Go to a ropes course. 18. Play paintball or laser tag. 19. Volunteer at a food bank. 20. Start a photo-a-day summer project. 21. Go to the pool. 23. Visit a zipline course. 24. Play ping pong (get this net to play ping pong on any table). 26. Learn to play the ukelele. 27. Go to the driving range to hit golf balls. 29. Hold a day camp for younger kids to earn money. 30. Learn to sew or crochet. 32. Write and illustrate a comic book. 34. Make treats and leave them on a friend’s doorstep. Ring the doorbell and run so they can’t see who left them. 35. Play Settlers of Cataan. 41. Go berry or cherry picking. 42. Take the bus/subway/train to a bigger city and explore. 43. Read one book a week (or more!). 44. Take an online class from Craftsy, Lynda, Khan Academy, etc. 45. Check out 40 cool hair braiding tutorials. 46. Make cool designs with alcohol ink and fire. 47. Make monster jaws from cereal boxes. 48. Learn how to transfer a photo to wood. 49. Look through your parent’s old yearbooks. 50. Take an SAT practice test for free. 51. Get a penny board and go for a skate. 52. Train for a 10k. 53. Make cool photo letters. 54. Go to an outdoor concert or music festival. 55. Hold an outdoor movie night. 56. Learn how to make pizza on your grill. 60. Go to the county fair. 61. Work on a 1000 piece puzzle. 62. Visit the YMCA or the city’s rec center to play raquetball or shoot hoops. 64. Play spoons. To make it more fun, place the spoons across the room from where you’re playing so people have to run to get them instead of just taking them off the table. 66. Sleep outside on a trampoline. 69. Have a Star Wars marathon. 70. Have friends over to decorate cupcakes “Cupcake Wars” style. 72. Go to an escape room. 73. Go to the nickel arcade. 75. Hold a chess tournament outside. 76. Learn to make jewelry. 78. Make paint pouring art. 79. Clean out your room and hold a yard sale. 80. Visit yard sales to look for deals. 81. Make a 2-liter bottle rocket launcher. 83. Mow lawns, wash cars, babysit, walk dogs, etc. to earn cash. 84. Ask you parents if you can earn money cleaning out the basement or garage. 86. Write a short story. 90. Go to a baseball game with friends. 92. Hold a bake sale to raise money for college or charity. 93. Visit the farmer’s market. 94. Learn to bake bread. 95. Plan a picnic with friends. 96. Learn to fold origami. 99. Go to an indoor rock climbing gym. 100. Go for a hike. « 35 best camping recipes so you never have to eat hot dogs again! I just signed up for emails and clicked on this post. Thanks Autumn! The Dice Game is something easy that my grandkids and I can play together!